9.5 x 7, 236 pp. like a haiku, this book is deceptively simple, revealing layer upon layer of insight and poetry with every page. in addition to patterns for making one's own kimono (teaching about it's history at the same time), it gives you follow-ups like, for example, images and patterns for vionnet's beautiful, kimono-inspired gowns. seemingly halfway between surface and volume, that is two-and-a-half dimensional. 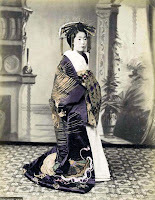 this impression of a garment with a hint of flatness is rendered in many a japanese print. 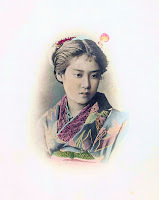 the book is filled with kimono, kimono fabric, and antique photos from milenovich's personal collection; you'll covet every one. most of the images you see here in this review are similar but not identical to those in the book. the book's are better. 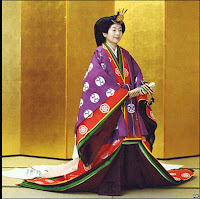 during the heian period (794-1185), the women of the japanese court wore multiple kimonos, one on top of the other. 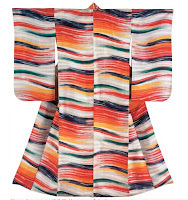 this fashion was known as juni-hitoe, meaning 'twelve- thick- nesses,' but the number of kimonos could go as high as twenty-five, making movement virtually impossible. the use of colors was rigidly codified, some being the privilege of an exclusive imperial circle. within this framework, the association of colors became an extremely sophisticated art that despite the tight constraints subtly reflected seasons, virtues, or sentiments, in addition to a taste or talent for demonstrating one's personal sensitivity. this art was known as iromi no ka- sani. 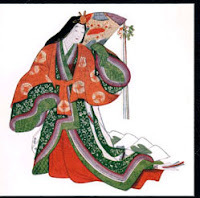 all the liter- ature of the time, and especially the poetry of sei shonagon, reflects a careful attention to chromatic blends and their significance. 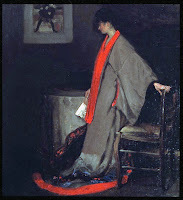 this sensibility to colors, which remains very much alive today, is the legacy of a very rich period in japan's history. 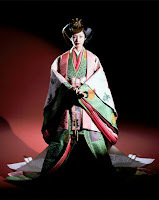 though the greatest per- centage of the book's focus is clearly kimono in japan, including instructions on how to tie an obi, a generous nod is given to japonisme, finding examples of some that are new to me. 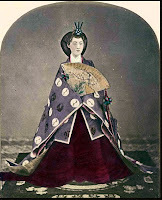 from these, the obvious becomes even more clear: western women wear their kimono in very different ways than japanese women do. An exquisite post Japonisme. It as though each post exceeds the one before. 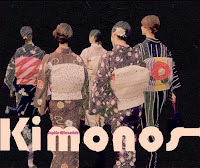 These kimonos are very beautiful ... and the book very interesting ! I like this post !!! ms princess--indeed, so many things woven. ms papillons--i'm so glad you like it. it is fun trying to make a review reflect the book.